Recently I had the opportunity to tangle some shoes for a friend who is part of the ‘Muses’ Mardi Gras crew. They hand out (not throw) decorated shoes rather than beads. I finished doing 6 shoes for her. The first shoe I did was a black heel using a gold metallic paint pen for the tangle design I planned following the contours of the shoe. I also tangled on the heel itself. Then I used gold paint on the inside and black with gold specks alphabet letters to adhere the word “Muses”. Then I did a light pink canvas shoe whereupon I followed the stitching to plot out my design. A black Sharpie marker worked well on the outside. I also painted the inside with black paint and used various colored Sharpies for decorating the patterned bottom of the shoe. I later added black paint to the area of the bottom which is still gray in picture. Again the word “Muses” is on the shoe. I followed much the same process for the tan heel and the blue canvas shoe. Finally, I was fortunate to tangle one of my partner’s baby shoes which she had just found. A black Sharpie worked beautifully on both the shoe and the shoelace after being washed. Making these shoes for the Mardi Gras Parade was a new and intriguing project for me. I enjoyed the creativity and imagination needed to decide the pattern for each shoe so it flowed in a natural way with the actual physical design of the shoe. I have used these pictures in both my Project Life album and for The Documented Life Project. In addition, they are now a part of my partner’s memoirs. I am always intrigued how almost every prompt has coincidentally allowed for me to document my week in a meaningful way. It happens again and again. The prompt of “Use a Chinese fortune cookie saying” for Week 32 just happened to follow a week where I brought home the fortune – a practice I don’t usually do. And not that the fortune was outstanding – it just seemed like a good idea. I had brought home a paper placemat as well. Since it was from a Chinese restaurant I was looking for an Asian themed background. 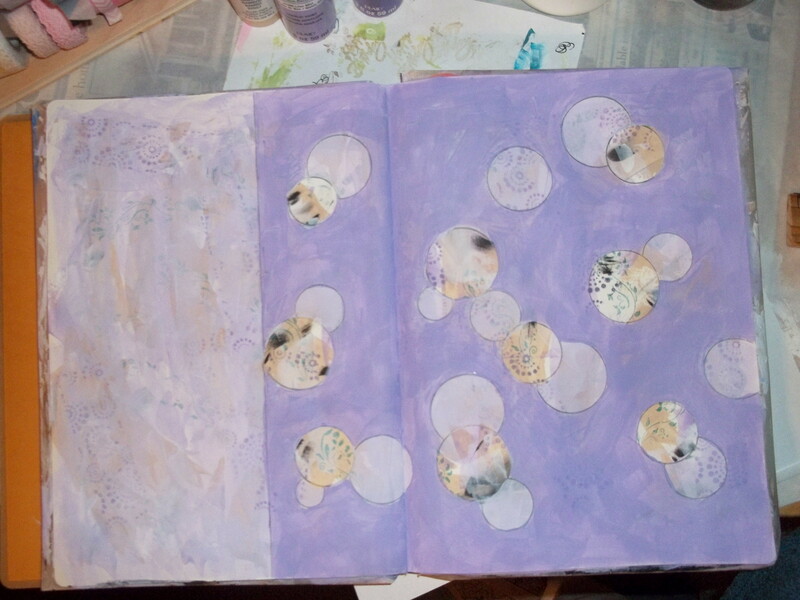 One of the gelli plate ages I had already done didn’t turn out very well. The colors were darker than I like, but when I looked at the design, I saw it had an Asian look to it with a trellis background. I added some stencil flowers of orange acrylic along with some vines of green and yellow. The fortune itself was pasted on a piece of colorful orange from another project. I cut off the key design from the menu and used it as a side and top embellishment along with some orange washi to divide for the days of the week. It was a great exercise in recognizing there are no mistakes in art that can’t be improved upon. Just re-layer/re-paint. 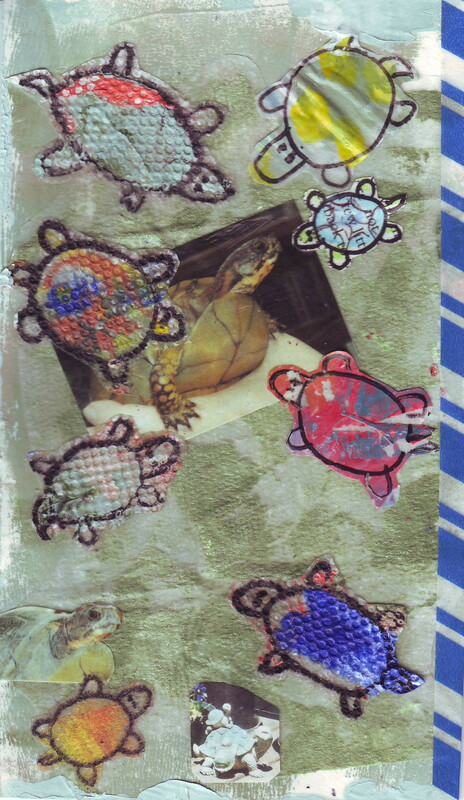 On the back of the tip in I did some gelli plate printing and added a long ago picture of myself wearing a Chinese-style dress gotten in Panama. On the center section I gessoed an interlocking block stencil which also added to the trellis look. 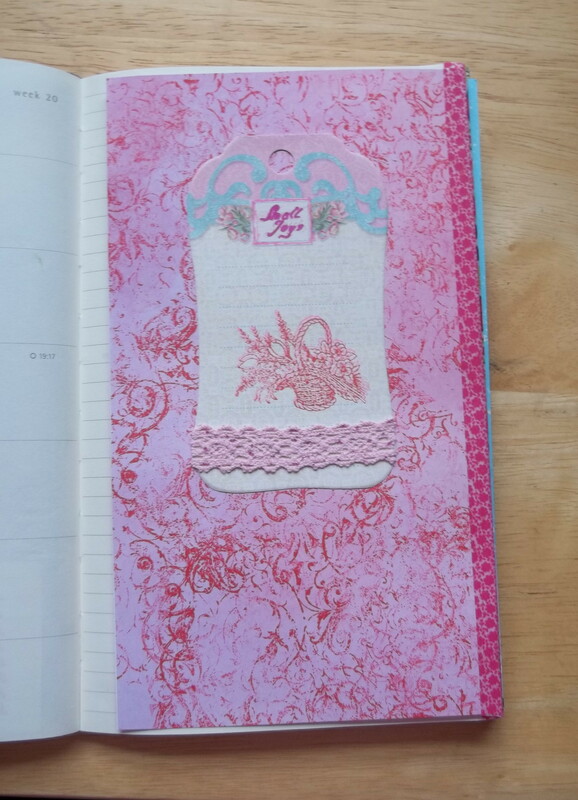 Everything was then ready for planner page and journaling along with some memoir writing about the dress and Panama. The fortune? “From now on your kindness will lead you to success.” This came in a week when I wondered whether kindness was worthwhile at time. In a world where some people feel okay about spewing out their opinions and yet don’t want anyone else to express theirs in return, I sometimes momentarily wonder about it all. 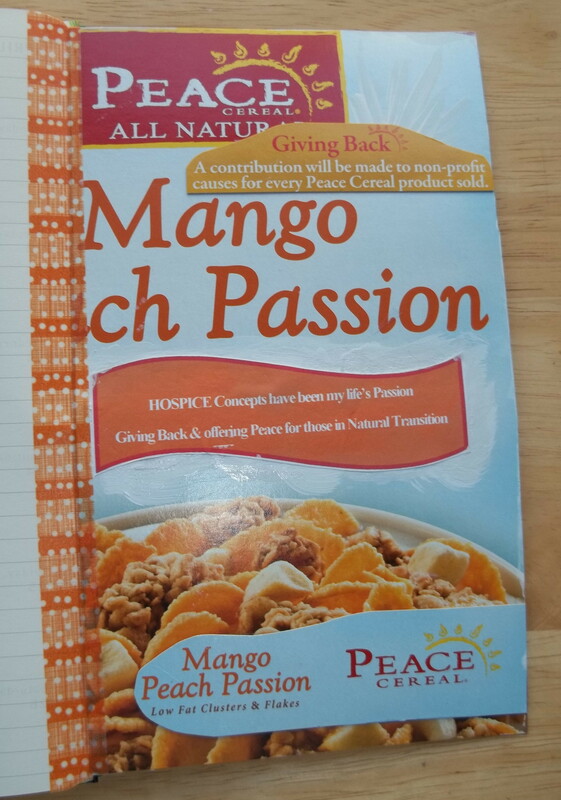 These pictures of the pages also then became printed out and included as part of my Project Life album. 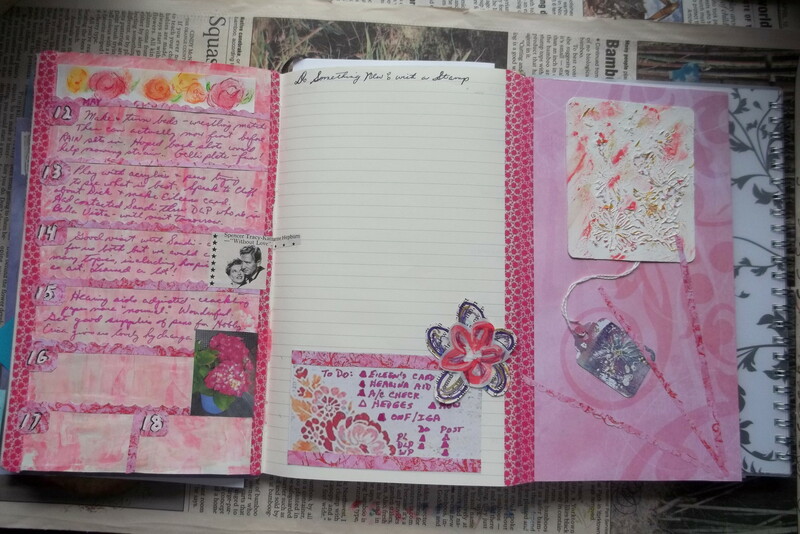 And this is the completed 3 page inside spread ready for lots of journaling and recording memories of the week. 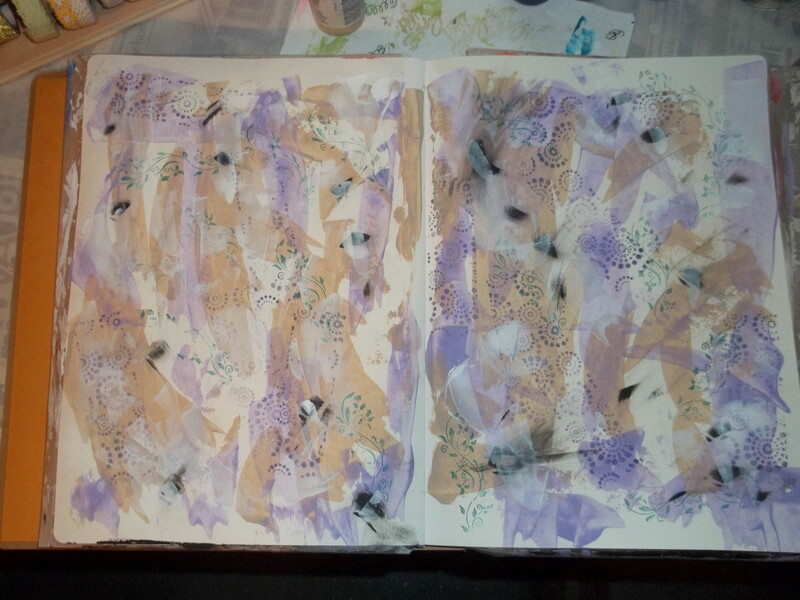 The right hand page is also made from using a gelli plate. 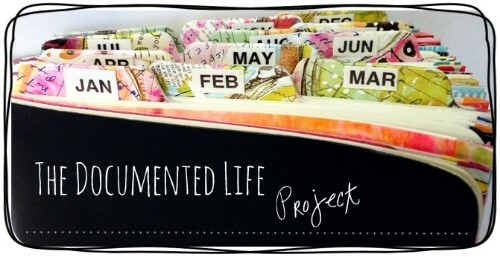 What a great way to utilize some of my beautiful Project Life cards in yet another project! 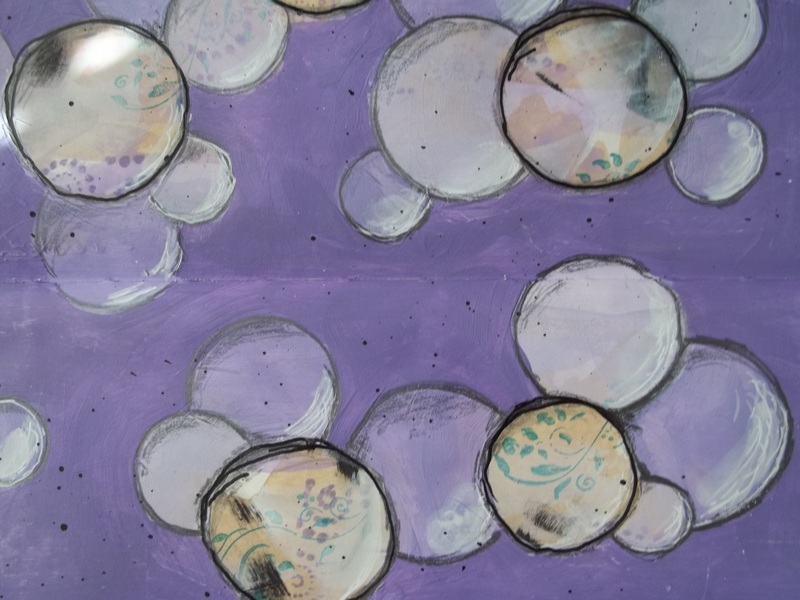 I’ve looked into purchasing a gelli plate because I loved the look of what could be done with them, but I found they were too expensive. So I wandered through Hobby Lobby just looking, not for a gelli plate, but for something that could function as a gelli plate with the same properties. 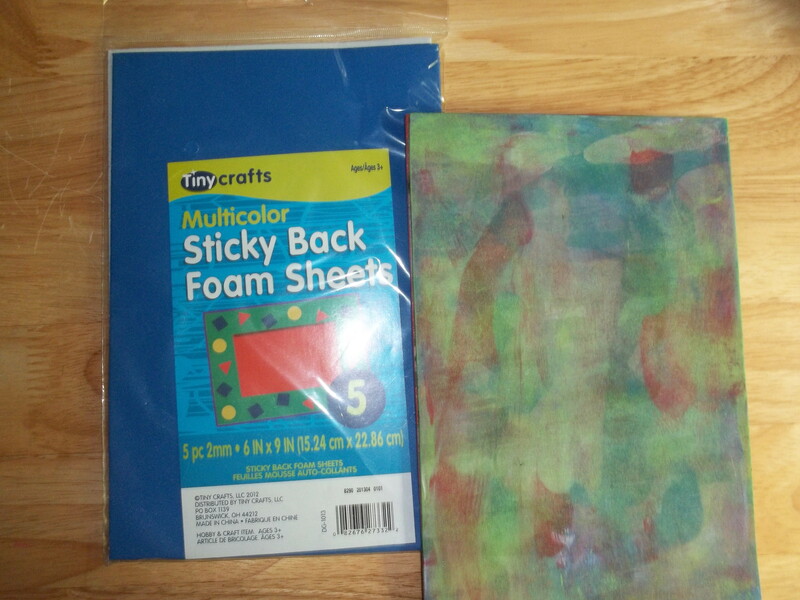 I came across craft foam in sheets with adhesive backings in the children’s section. Adhering two of the 6 x 9 sheets together added some thickness and give to a solid surface. I’ve used mine over and over, washing it out in between, and keep getting great results. It may soak up a little more acrylic paint than the regular and you can see that some of the paint remains on the sheets even after washing, but it still works great. The price difference is worth it. 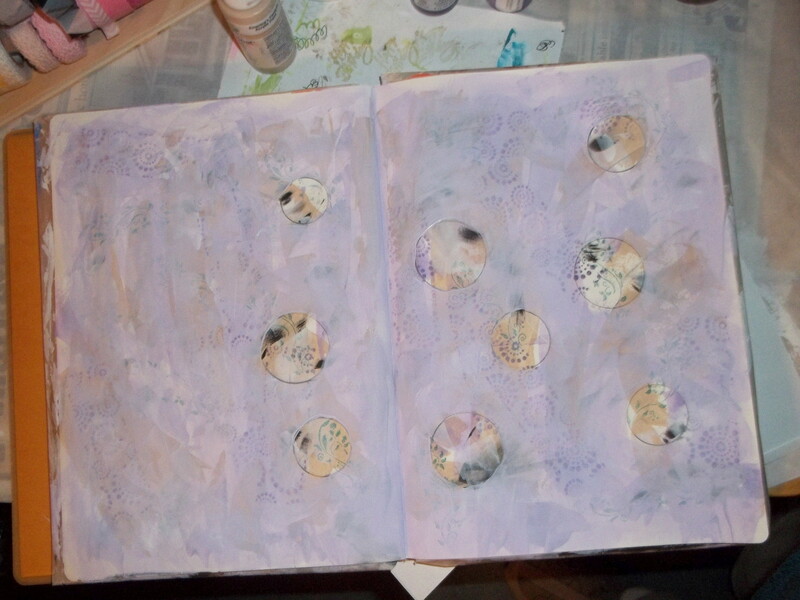 Here, the left shows 3 gelli plate with stenciling pages ready for journaling/planner for a Document Life Project set of pages and the right ready for use. 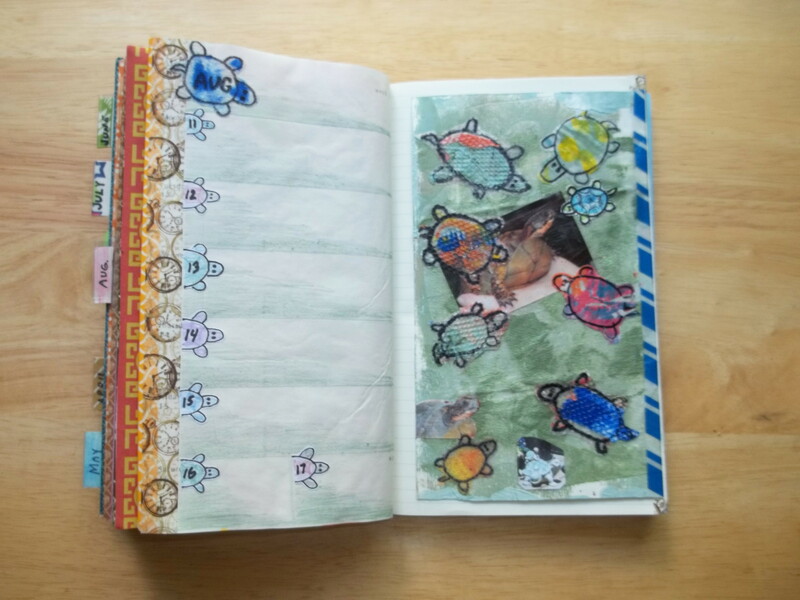 For years I have been intrigued by the pictures of various art journals, both the images and the ideas expressed. Usually the ideas are a phrase or a quote. But I also like to process and journal my feelings and patterns I discover within and without myself. 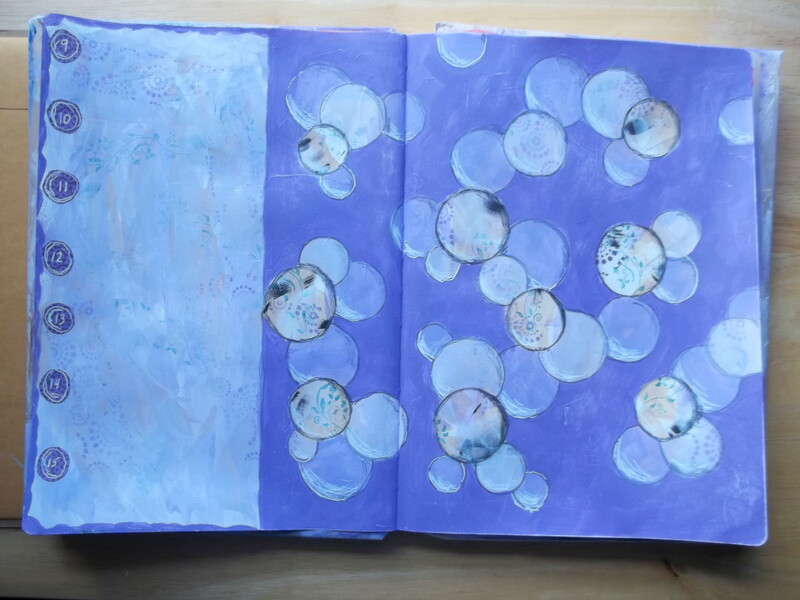 But for some reason I never attempted to actually art journal, keeping my journaling and memoir writing separate from any artsy stuff I would do. I realize I never thought I could really do the “artsy stuff” myself. A perfectionist artist father both gave me some tools for art and discouraged me from doing art, or even thinking of myself as an art person. Soul Food Café facilitated by Heather Blakey, was the first internet site that really drew me in with its writing prompts and information on how to set up a blog. The group was inspiring and encouraging to someone just starting out. I loved writing as I wove in memoir and experiences with the fantasy stories. These became part of my blogging (see blogs starting at the beginning in 2008) and proceeding onwards for those writing regarding trips to Lemuria and Riversleigh. 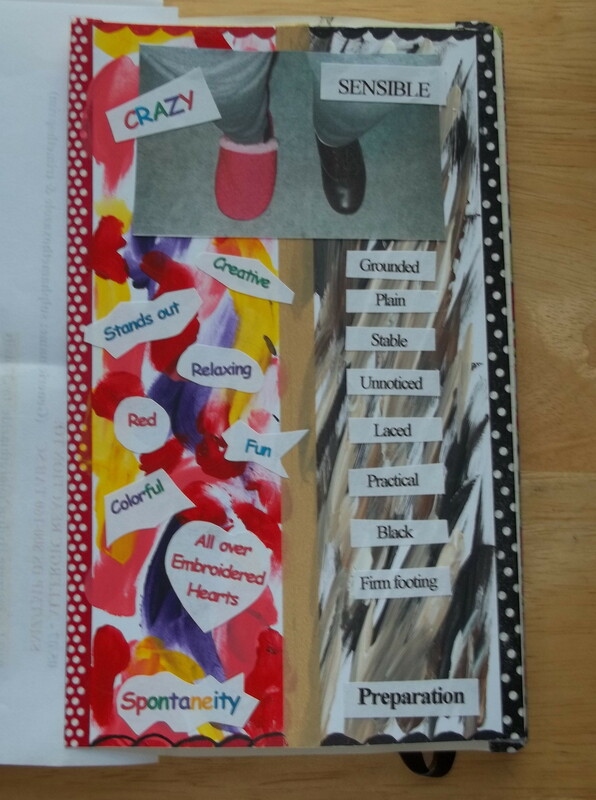 Shortly afterwards I came across SoulCollage (formulated by Seena Frost) and Kaleidosoul (facilitated by Anne Marie Bennett) which really resonated with me by having both aspects of the collage making and journaling to specific questions from the collage picture made. 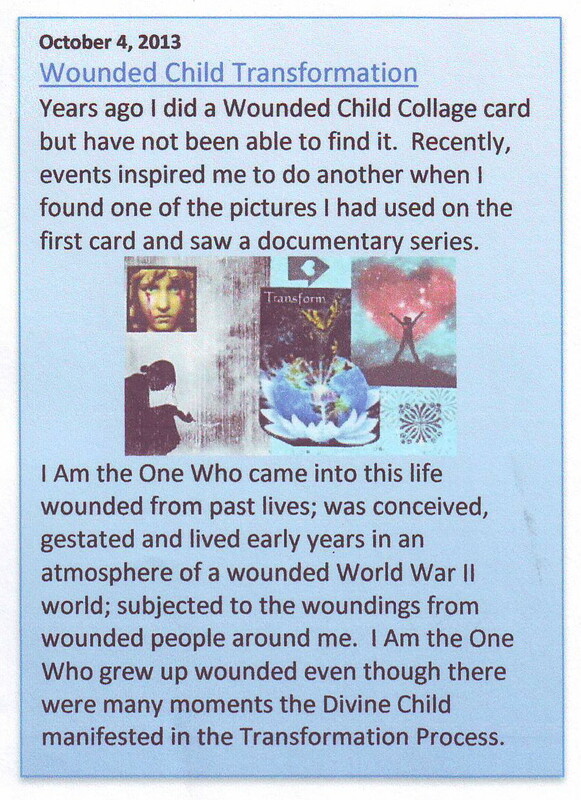 The questions used (see my SoulCollage-Kaleidosoul page for the list of questions) are as if the collage picture itself is speaking, allowing the unconscious to come forth at times. 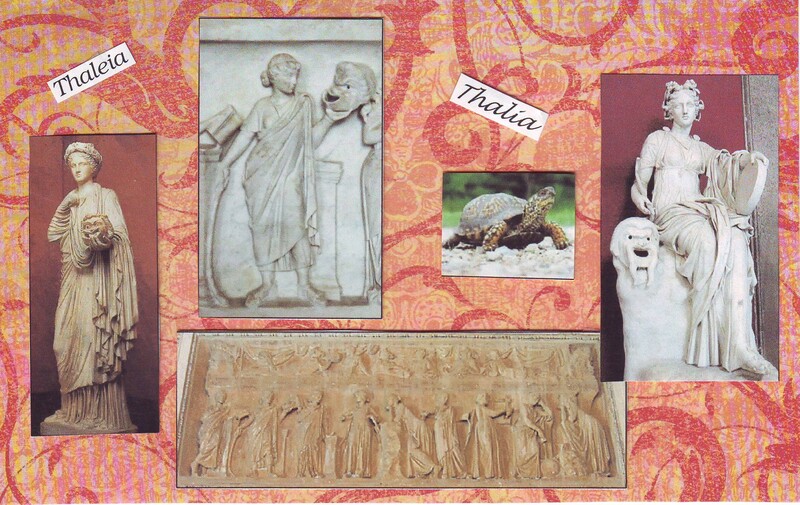 I also used the collages I made as part of my posting in the Soul Food Café and Riversleigh posts. SoulCollage and Kaleidosoul questions and answers combined into Project Life cards for my album in addition to photos of my everyday life and special occasions. 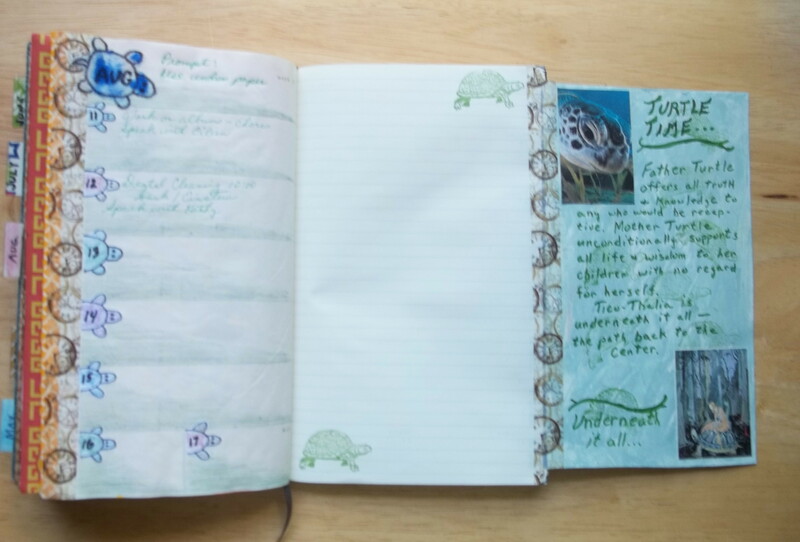 Project Life has provided a rich tapestry of daily life in photos and words. 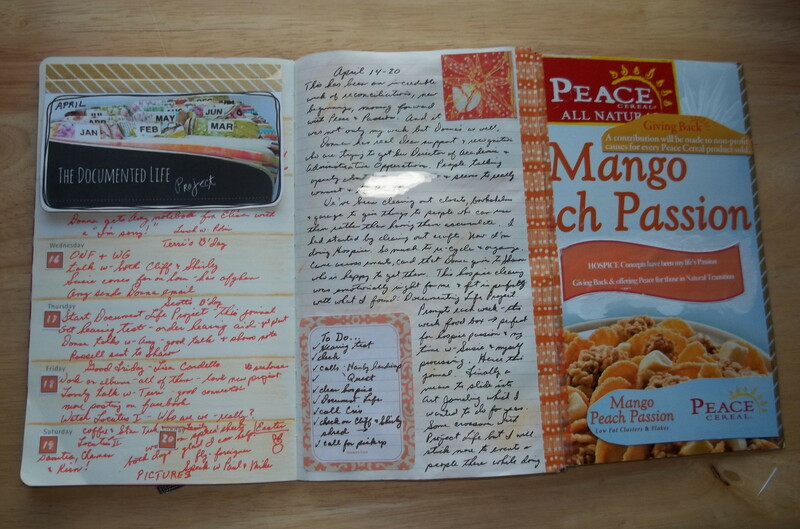 Some pages had more journaling than others, but generally was limited by the size of the inserted cards, even when using the back of the cards. 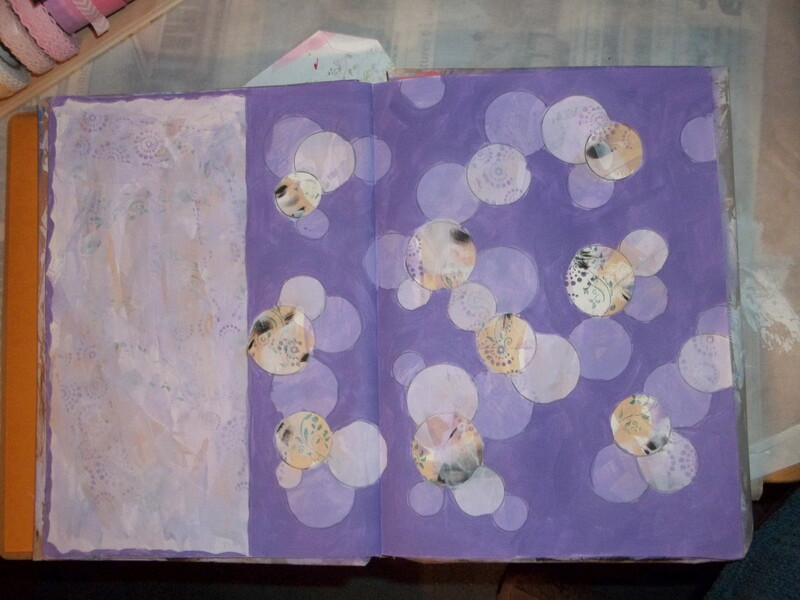 Document Life Project took everything one step further and really got me I into art journaling. The prompts were inspiring for a page or two of doing art, as the Art to the 5th Academy website and Document Life Project facebook page had wonderful videos and instructions for learning how to use the wonderful tools of art available. 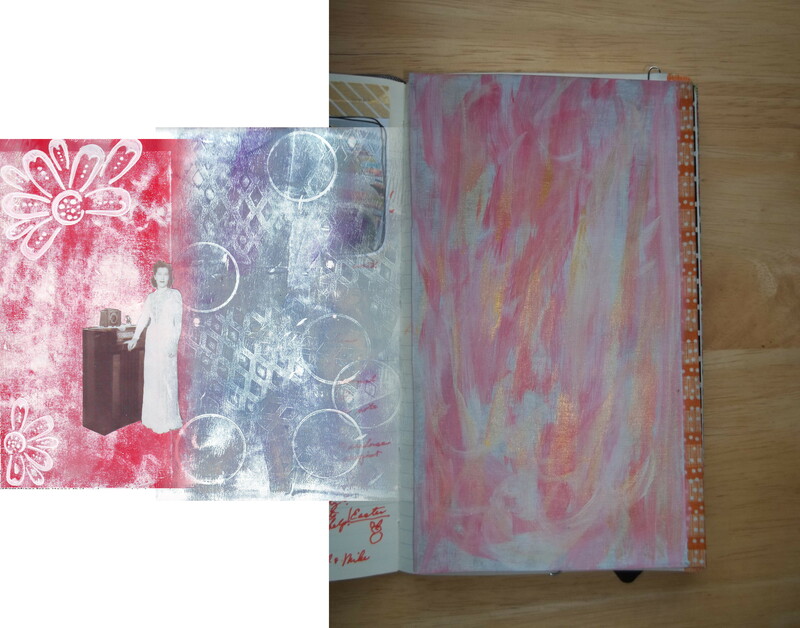 The moleskin journal recommended also included a page for planning (left side) and a full page for journaling (middle page) as well as the added yip-in art page (right side of gesso, acrylics and stencils). 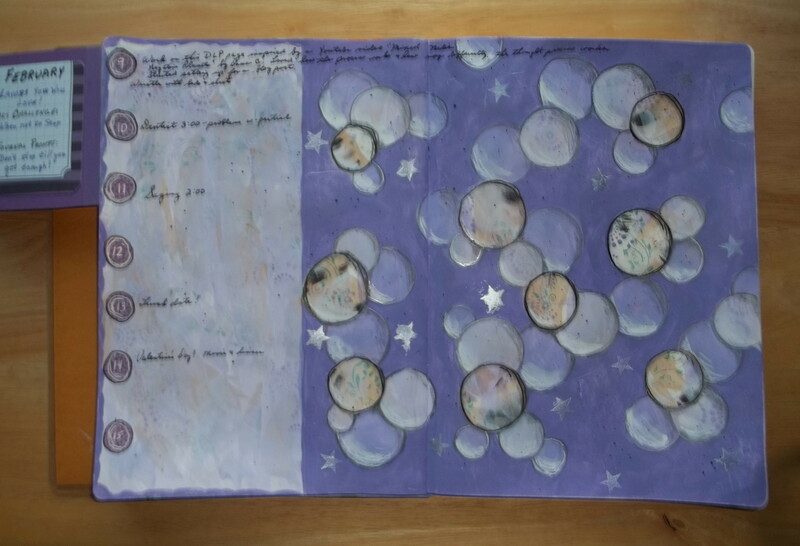 This all truly combined my love of journaling with playing with art – a true combination of visuals and words. 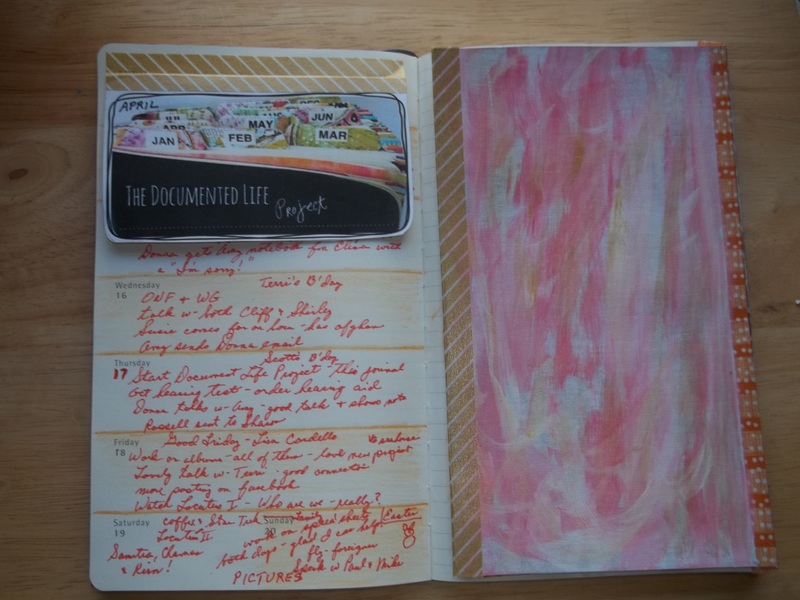 Less than a month ago I came across “The Documented Life Project” which combines, if you follow their pattern, using a planner plus adding art journaling with one weekly challenge. There are some free video tutorials as well as fee-based workshops which are excellent. Roben-Marie Roberts Smith, Lorraine Conte Bell, Rae Missigman, Barbara Copeland Moore and Sandi Keene are the five ladies who have organized this into a year long project complete with a closed facebook page for sharing one’s finished projects. 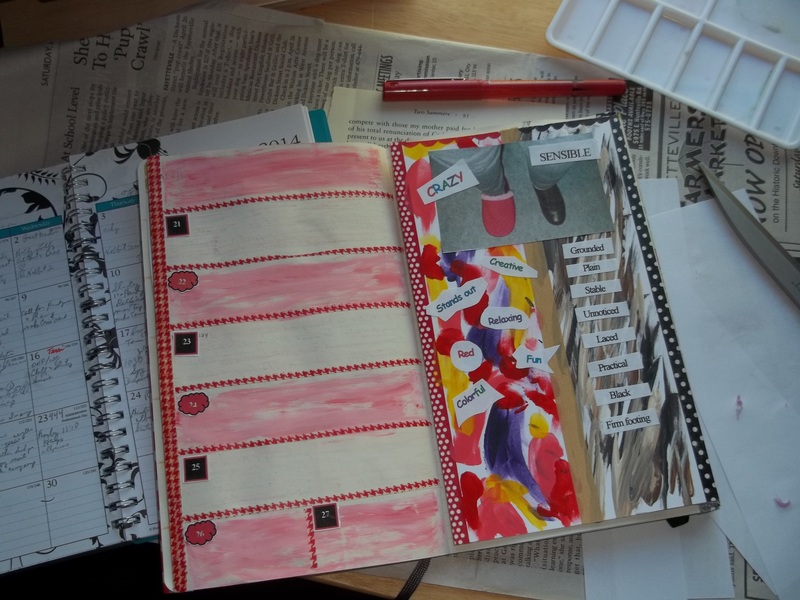 One could use collage, painting (either water coloring or acrylic), doodling, scrapbooking, anything that you enjoy in which to organize your planner and art and journaling facets of yourself. There are no do’s or don’ts. This gave me the information tutorials to know what to do and the freedom to play on my own. 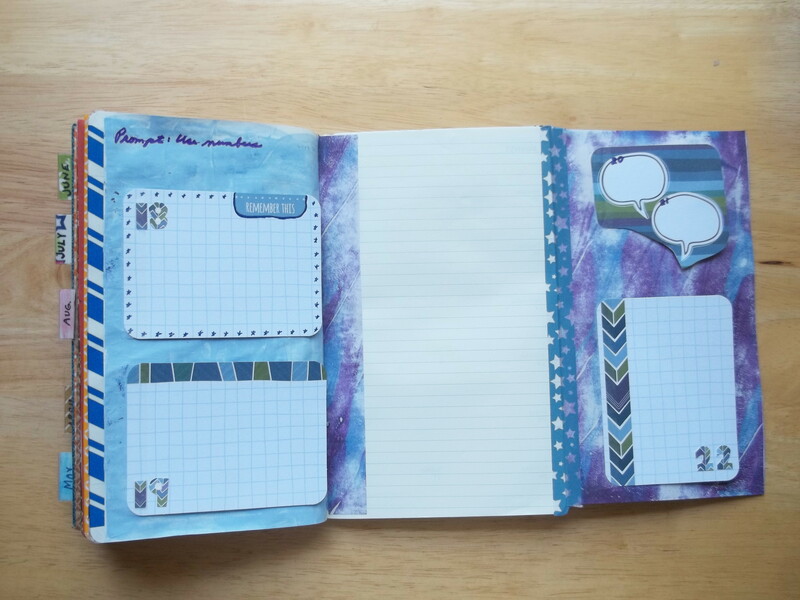 I also take pictures of the album/planner pages so as to incorporate it all into my Project Life album pages. Project Life will focus on people and events with a sprinkling of thoughts whereas DLP will focus on the thoughts of the interconnected week’s events and people therein related to the prompt. Then I worked on my calendar side with coordinating colors for the daily dividers, etc. I also included a To Do List and a top tip-in on my calendar page honoring my start of the DLP. 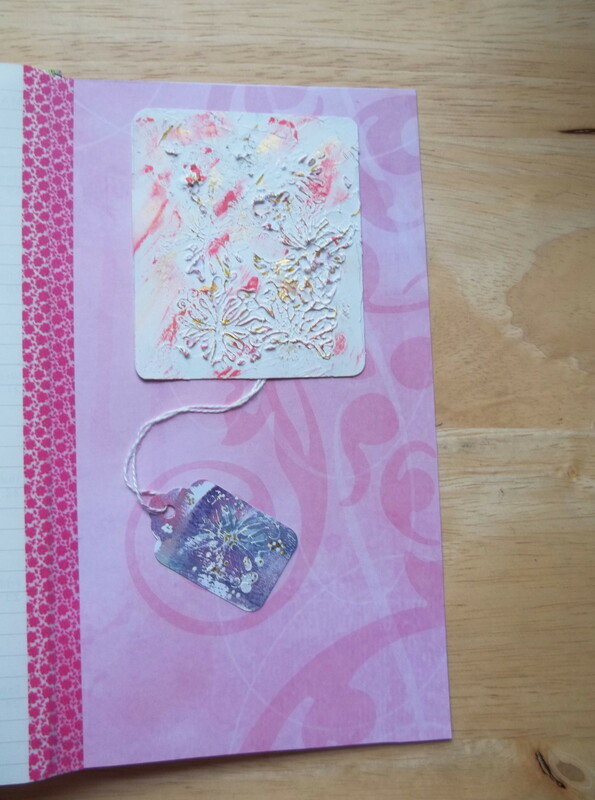 Finally I played with gesso combined with pink, cream and gold acrylics to form the foundation on the back of the tip-in to provide a base for more journaling carried over from the middle page within. I took pictures of the various layouts and added to the Documented Life Project facebook page as well as into my Project Life album for this year. 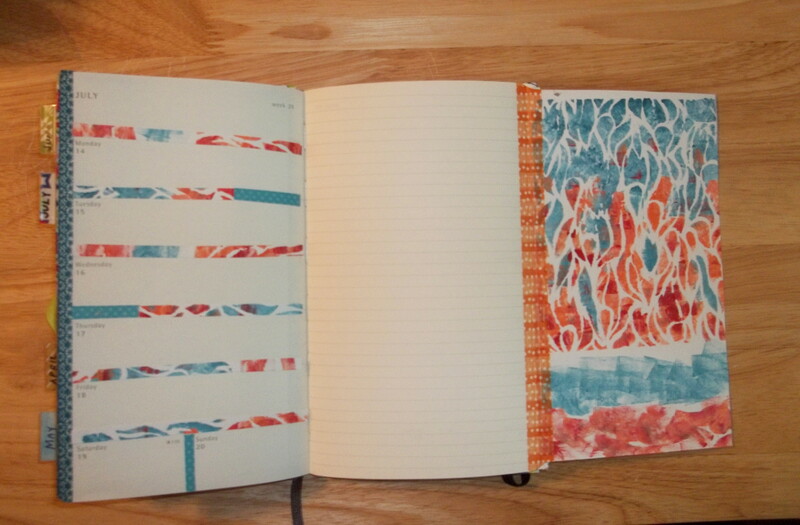 I keep both journals/albums open and move from one to the other, getting inspiration and enjoyment from each.